> Hello Kazuo! > > "> However, I'd like to make sure 'gray/gray/black' you wrote means 'original 2 grays + black'?" > - YES, this is exactly what I'm saying.- > > I've saved this photo (62-8877)in my computer but I can't remember from where in internet I've gotten it. 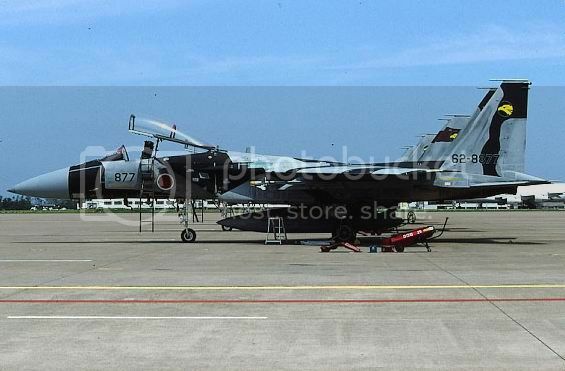 > > http://i812.photobucket.com/albums/zz44/ltmotta/F-15J/877_zpsdeac2qh4.jpg > > I know... it doesn't look the Aggressor Squadron (Snake head on tail) but it does look the camouflage pattern what I'm looking for. > Please, feel free to e-mail me any picture or link. > Kind regards. "> However, I'd like to make sure 'gray/gray/black' you wrote means 'original 2 grays + black'?" I've saved this photo (62-8877)in my computer but I can't remember from where in internet I've gotten it. I know... it doesn't look the Aggressor Squadron (Snake head on tail) but it does look the camouflage pattern what I'm looking for. Please, feel free to e-mail me any picture or link.